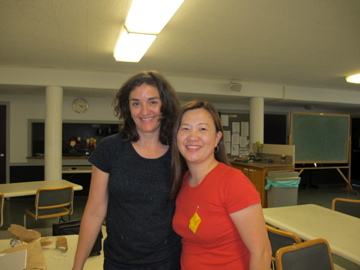 Anyway, back to the workshop.... First of all, Denyse is every bit as awesome and nice as she seems. She's very laid back and such a great teacher. 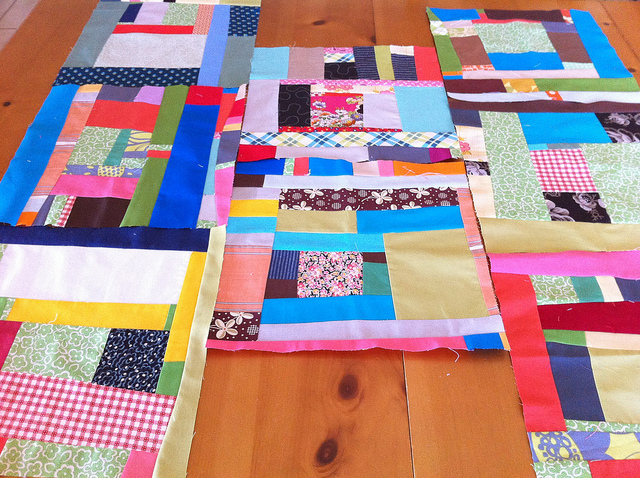 I thought I knew how to make an improv quilt. I was wondering what I would gain from this class. Boy, did I learn alot! Using what I have, curves, but the biggest lesson I learned was to "LET GO". It was so 'freeing' once I did so. Here are the first 2 blocks I made only using the fabric that Denyse provided. Notice the natural curves? That because I didn't use my ruler. That was pretty cool too! 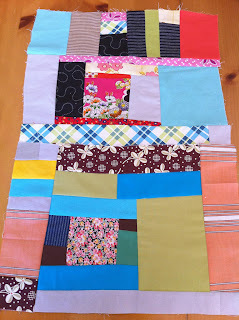 Here are the other blocks I made using fabric that I brought. It's the KJR green posies. 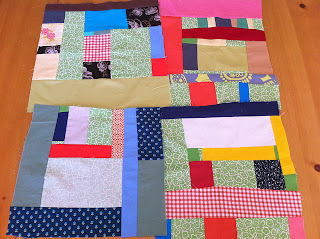 On the bottom left block, I used the wrong side of the fabric by accident. Denyse saw what I did and said, "Just go with it". I was like "REALLY?!?!?" So I did and I'm happy to say that I love that block. I made 2 more blocks a few weeks ago. I decided to to turn these blocks into a wall hanging / art quilt that I'll hang in my sewing space. It will go nicely with this photo. Thanks so much for vsiting us, Denyse!!! You are truly a Rock Star!